The “poetician, not politician” always seemed conscious of the Russian adage that a great writer is more than a writer—he is a second government. 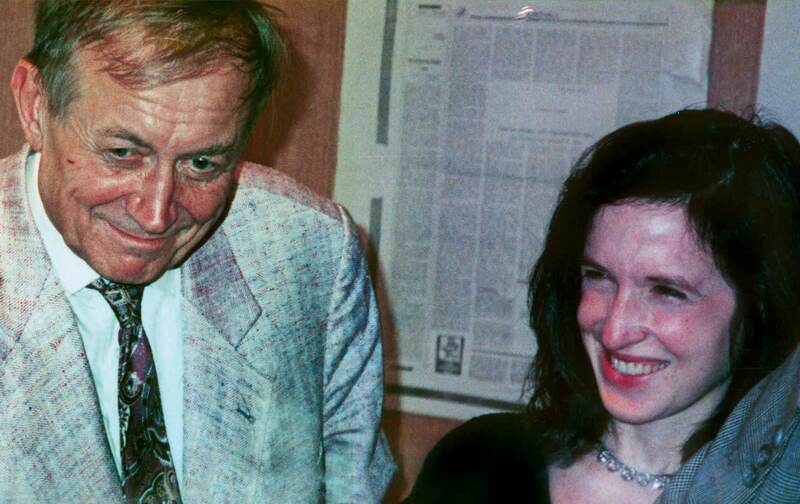 Poet Yevgeny Yevtushenko and The Nation editor and publisher Katrina vanden Heuvel. On a cold night in 1986, my husband Stephen Cohen and I were speeding through Moscow in a car driven by Yevgeny Yevtushenko. Zhenya, as we called him, was pulled over by the traffic police. As we waited, our friend grew increasingly anxious—and not about the consequences of his driving. At that moment, he was nervous about the possibility that the authorities might search his car and discover in the trunk his copies of Aleksandr Solzhenitsyn’s The Gulag Archipelago, still banned in the Soviet Union but published in Russian abroad. Looking back thirty years later, we might think glasnost, a new era of openness, was already inevitable. But the truth is that for those who lived and struggled through that time, change was far from certain. Even after the determined reformer Mikhail Gorbachev emerged as Soviet leader in March 1985, his policy of ending censorship unfolded slowly, in fits and starts. Indeed, it took nearly three years for people to understand that major changes were afoot. As a globally renowned poet, Zhenya was a key messenger of the new unfolding reality. Many now know of his death last Saturday, and of his remarkable life. We have read about the indelible role he played in Russia’s history and cultural progress in the countless obituaries in prominent papers that have been written. The Nation was privileged to feature his work over the years. It ranged from a piece, “The Fascist Boot in Minnesota,” for our 120th-anniversary issue, to his poem “The Loss,” which appeared in The Best of The Nation (1990-2000), to a wonderfully sentimental and somewhat ironic poem about Steve and our family on Steve’s “jubilee” birthday. Throughout our decades-long friendship, I came to know a man acutely aware of the role of the artist as more than an observer. Zhenya understood that his fate, and that of Russian culture itself, were inextricably linked to the fate of his country–and this inspired his role during the remarkable years of glasnost and perestroika. Don’t think that glasnost or perestroika dropped from the sky or that it was given to us by the Politburo. It was many years in preparation. The new generation of leaders absorbed the spirit of our literature. They were students when we began reading our poems in the 1950s. They squeezed onto the balconies of our poetry readings without tickets. My generation of poets did a lot to break down the Iron Curtain. We cut up our bare hands assaulting that curtain. Sometimes we won, sometimes we lost. Sometimes there were tactical retreats and sometimes we lay on the ground after a hail of insults. But our literature didn’t come as a gift from the so-called upstairs. We worked for it. We forged it for ourselves and for future generations. No wonder Zhenya had no use for abject conformism, no patience for indifference, and no tolerance for violations of humanity. Your hard-liners explain their position by saying there are hard-liners in the Soviet Union. And our hard-liners are trying to close our openness, our democratization, because they are waving this image of American hard-liners. So they both need each other… it is a very dangerous game that they’re playing; they are practically sawing off the branch on which they are sitting. Later, with poetic precision, he called out a contradiction in America’s own politics. “Just like our reactionaries, your reactionaries need the image of a bogeyman… You love our liberals… but you don’t like your own liberals. You should support your local liberals, too,” he said with a provocateur’s grin. Zhenya saw his work as “human rights poetry; the poetry which defends human conscience as the greatest spiritual value.” That is the lesson of his most famous poem, “Babi Yar,” a lesson worth remembering today, as Ukraine’s government and its right-wing allies whitewash the Nazi collaborators who helped carry out the atrocity. In that one line is all you need to know about the great artist, about an extraordinary life, about our dear friend, Yevgeny Yevtushenko–a man of passion and soul who, until the very end, believed in the humanity in each of us and was determined to change the world accordingly.